Lately, I’ve been working on so many things I want to share with you! I’ve been crocheting up a storm, I baked macaroons, I’ve tried more chocolate chip cookie recipes, I joined a book club, I changed my last name, and I tried my hand at making jewelry! I’m sure I’ll tell you about all those things, but today I wanted to share some of the cutest work I’ve ever done! As you might remember, I’ve crocheted several holiday baby hats over the past couple years. I love crocheting baby things because they’re so small, it doesn’t take too much time, and you can make everything super cute and tiny. 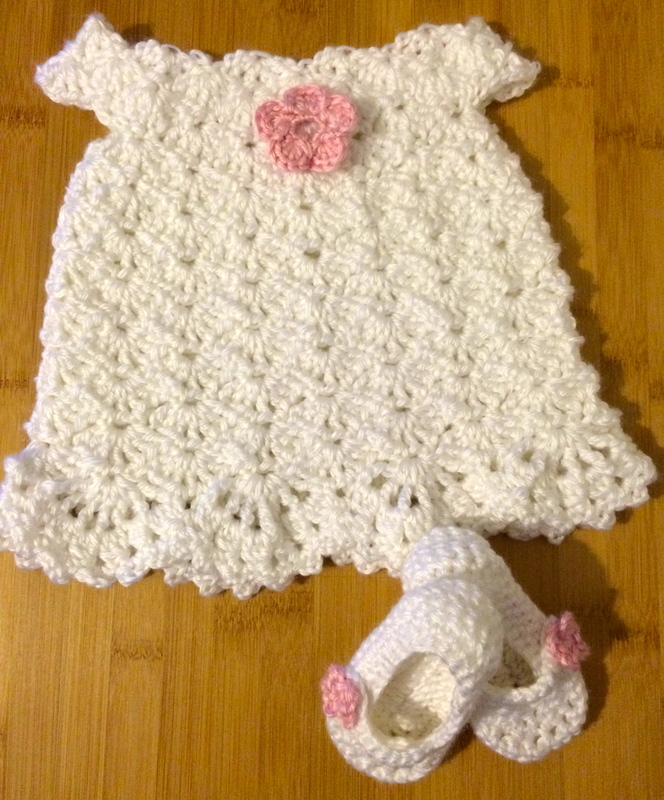 My mom’s cousin had a baby recently, and she commissioned me to make her a few things for the baby girl. I couldn’t even handle how cute they turned out! My mom asked for white Mary Janes, but there was no way I could make the Mary Janes and not make this ADORABLE dress to go along with it! 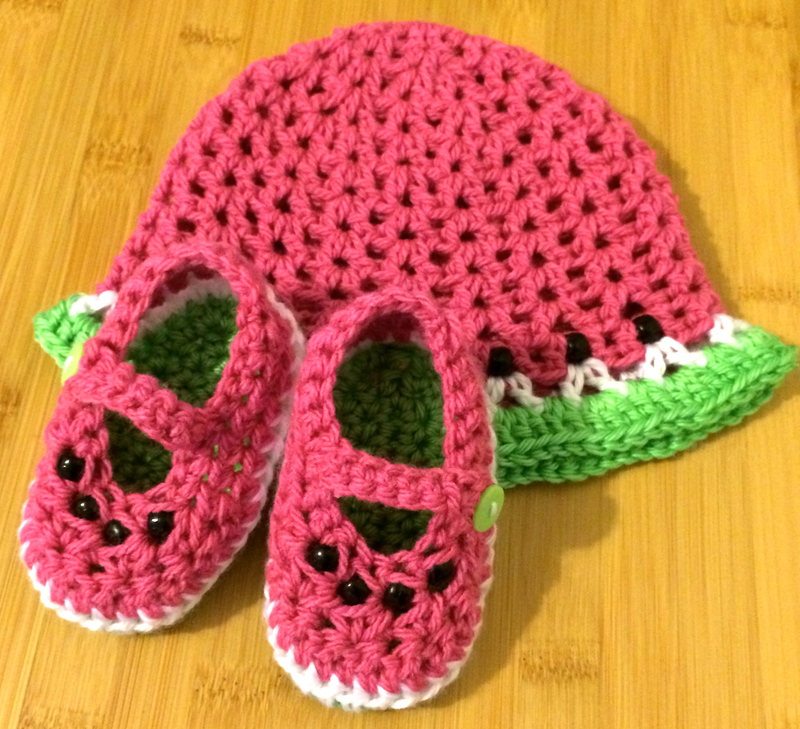 Then I saw several watermelon inspired accessories, and decided on these! I just thought they turned out absolutely adorable, so I wanted to share them with you! All the patterns where free, and I’ve listed them below, along with the revisions I made. I used Caron Simply Soft yarn in White. For the flower, I used this pattern with Caron Simply Soft yarn in Soft Pink. 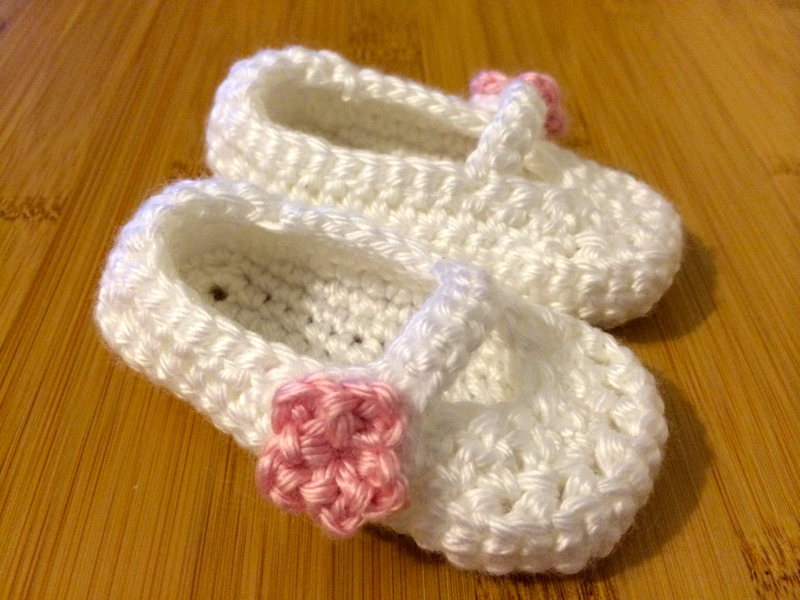 I used the same White and Soft Pink yarn. 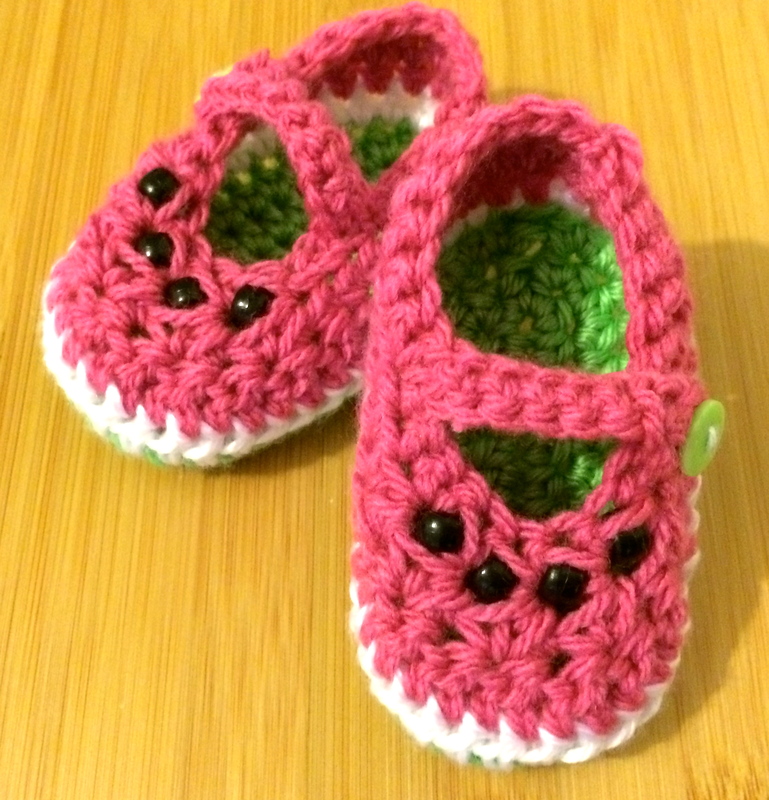 For the flower, I used the flower from this pattern, which is also great, but only for shoe size 0-6 months. I used an old pick yarn that I had on hand – I’m sorry, I don’t have the brand or color! But your standard bubble gum pink. I used black basic craft beads that I bought on Amazon, but you can find them anywhere. I strung them onto the chain stitch of row 9, just for the front portion of the hat (for safety reasons). I did not use the row 10 directions, and for row 10 I followed the same directions as 9, and used Caron Simple Soft White. I also did not follow Row 11 directions, and instead did 3 DCs in each V stitch of the last round, and 2 DCs between each V stitch, using Caron Simply Soft in Chartreuse. This is the pattern I referenced in the other Mary Jane notes. In order to make them a little bigger than the directions said, I used a bigger hook (I used a 5.5 mm). I made the sole with Caron Simply Soft in Chartreuse, the first row of the “upper” with Caron Simply Soft White, and then the rest in the pink I can’t remember. I strung the black beads in following each hdc2tog in round 6. Let me know if you have questions! Hope to see you again soon! Happy crafting!